Since coastal cruising is new to us, we are doing our best to stay wide open, clear, and limit our expectations. We set out for the Golden Gate on Friday morning with minimal fanfare, just texting a few friends late the night before. 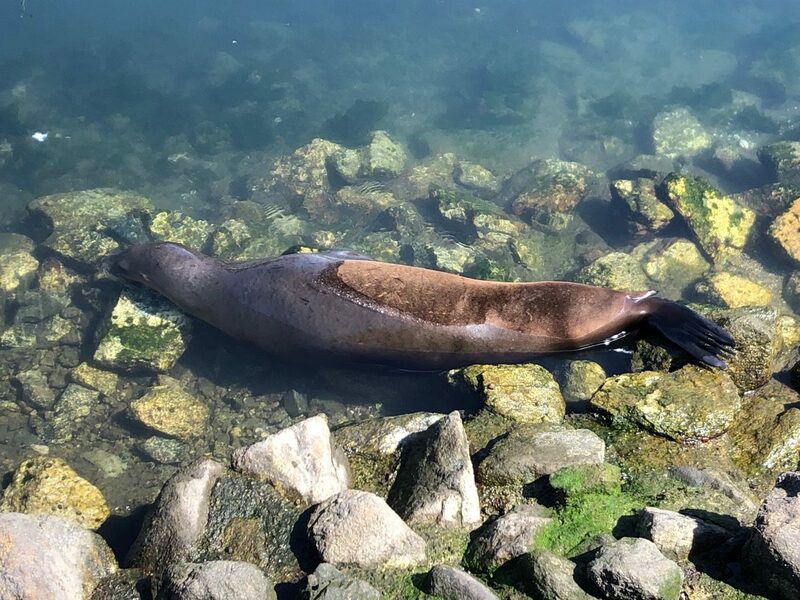 We didn't tell our marina or our parents we were gone until after we achored safely and happily at Pillar Point in order to leave open the possibility of returning for more time at a familiar home base should that seem wise. We made no schedule; we just said: let's take this hop and see how we feel. We felt great! And the weather was looking good! So the second morning, we pulled up our anchor and hopped on down from Half Moon Bay to Santa Cruz. Upon departure, winds were light and seas confused in big swells; we were getting tossed about on waves coming from two different diagonals (that's what the "confused" means), which is not comfortable. 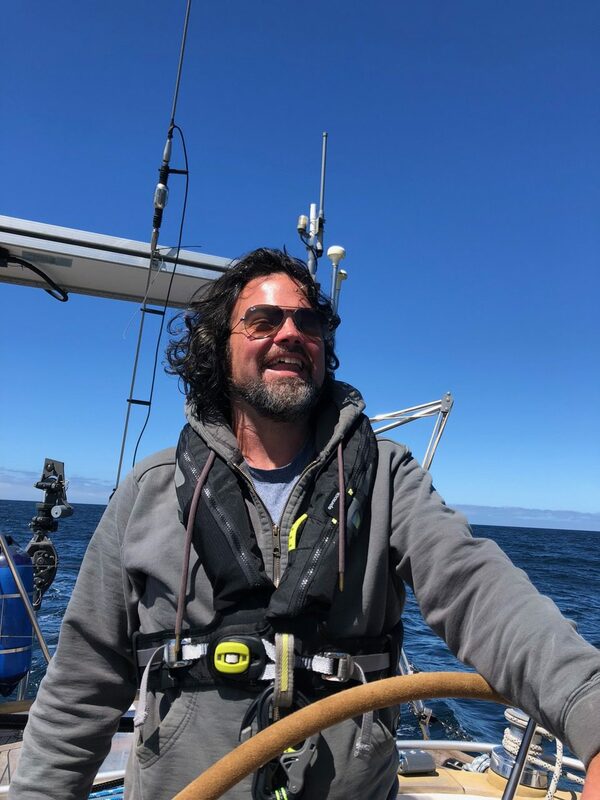 For the year we’ve been sailing Rejoice on the SF Bay, James has always gone forward to bring out the main (we have in-mast furling) while I hold our course at the helm (the steering wheel). He has a better instinct for surfing those big confused swells, though, and was at the helm wanting to raise the main to stabilize us and looking grim about the conditions. I, who was terrified even to helm a year ago, convinced him I could do it and was excited to do so. I clipped my tether (a leash that attaches to my life vest) into the jacklines (straps that run the length of the boat for us to clip our tethers to so that we are attached to the boat) for the first time, crawled forward, and unfurled the main, clinging to the mast and bobbing on the waves, shouting I AM DOING THIS! THIS IS GOING GREAT! I LOVE THIS! (and, I confess:) I AM SO AWESOME! I LOVE ME! After we rounded Año Nuevo, the wind finally picked up and we were able to cut the engine and sail. James was a little happy about this. 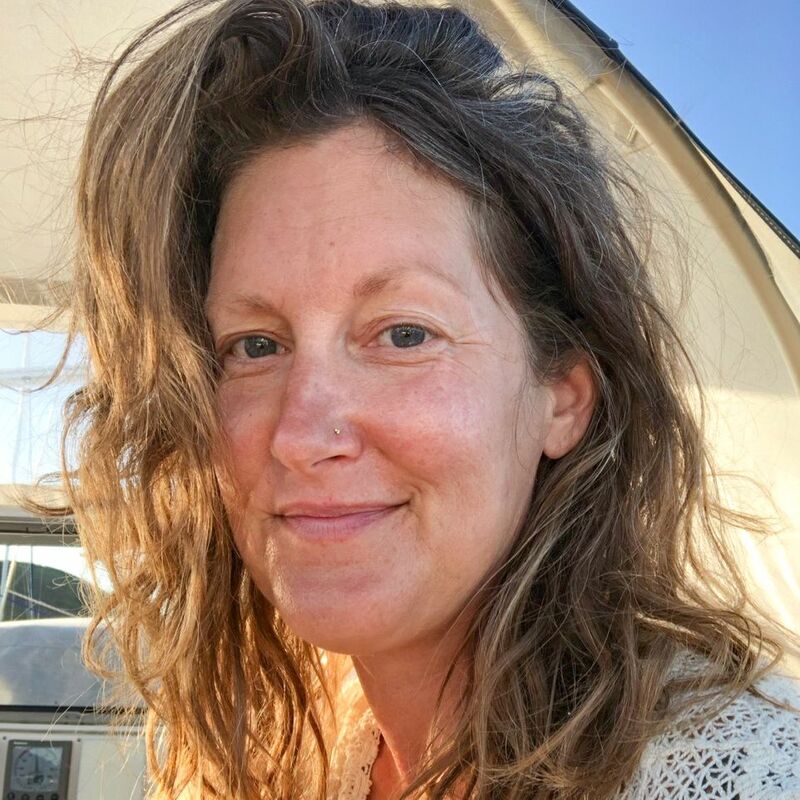 Thanks to my kind friend Sarah who made the trip the day prior, I knew to expect what came next — rapidly rising winds until we had brought the main down to about 2 reefs and half-furled the jib. (This means we made our sails smaller so that the boat felt appropriate in its speed and movement given the wind conditions.) I went forward for every reef and to un- and retie the preventer for every jibe; James went forward only to set up the preventer. I loved it; he hated it. Just the opposite of what we imagined! We were thrilled to be able to meet the moment spontaneously and look forward to practicing lots so that both of us become fluent in all roles with time. We were a strong, supportive team all day and felt more in love than ever at the end of it. I am covered in bruises and woke James laughing in the night when I realized I was grinding winches in my dreams. Santa Cruz is a very rolly place to anchor, so we got an end-tie at the marina, put on some clean clothes, and walked up to get dinner on shore. We took long, long showers. Sunday the weather was still good and we and 'joice were in great shape, so we sailed across the Monterey Bay. The Monterey Bay is famous for its beauty and richness of life, and we were treated to great delights. At one point, we were surrounded by what must have been around fifty dolphins. At another point, there were suddenly many loud birds dipping close to the water nearby, so we began to look for whales, and one surfaced RIGHT beside our boat. Had I stepped over the lifelines, I could have stood upon its back! It was RIGHT HERE. It was a humpback; the distinctive ridge was clearly visible. Later, another humpback about 300' away breached and twisted gloriously, three times in a row. We screamed with joy and I wept from the wonder of it. 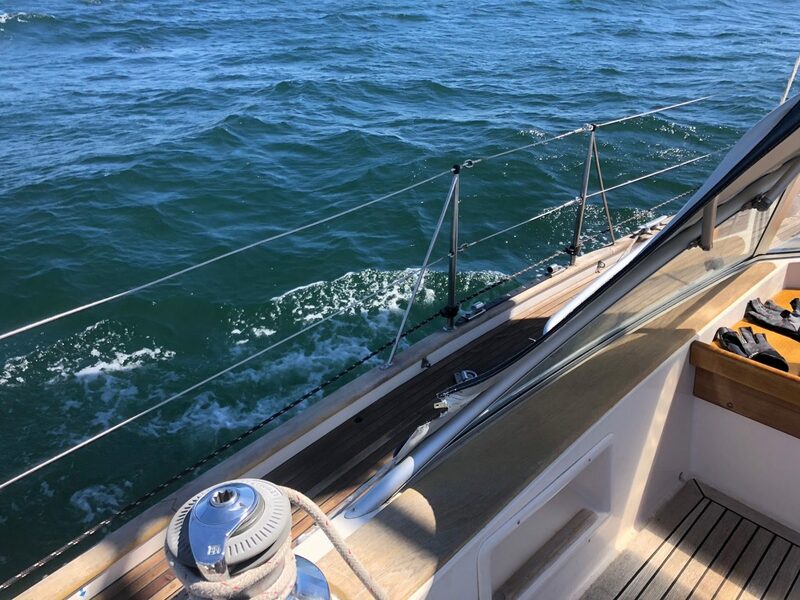 The winds picked up as the afternoon went on, and our Iridium said that we were making 9.2 knots when we surfed the swells in to arrive at Monterey Municipal Harbor! We were skeptical of this, but then our friends said they'd done 8.2 the day before, so. 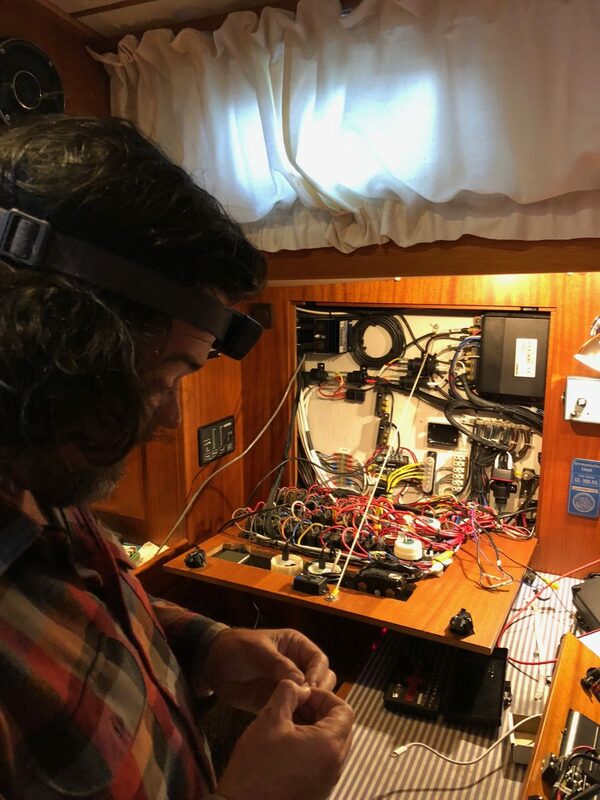 We've been in Monterey for a few days now; the weather has not been agreeable for our next hop, so we started the next set of repairs and upgrades. James is replacing some wiring and instruments. I have been cooking and freezing food for the longer sails which lie ahead. We've gotten good rest. I went to a yoga class. We hung out with our new friends Charlie and Sarah of SV Blossom a bunch. All is well.